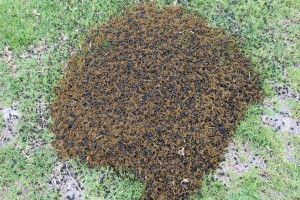 I have never seen so many dung beetles in one pile before. It was the only offering in the paddock and it looked like they were queuing on the grass waiting their turn, with more flying in constantly. 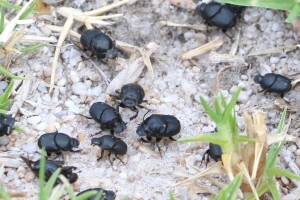 When the sea breeze starts in the afternoon, our covered deck area is like the dung beetle super highway and you hear constant clicking noise as they fly into the side of the house and patio posts just following the scent upwind.